Are you a fan of that memory foam feel but don’t like the idea of being enveloped by the mattress? How does winning a new memory foam mattress that avoids this trapped feeling sound? 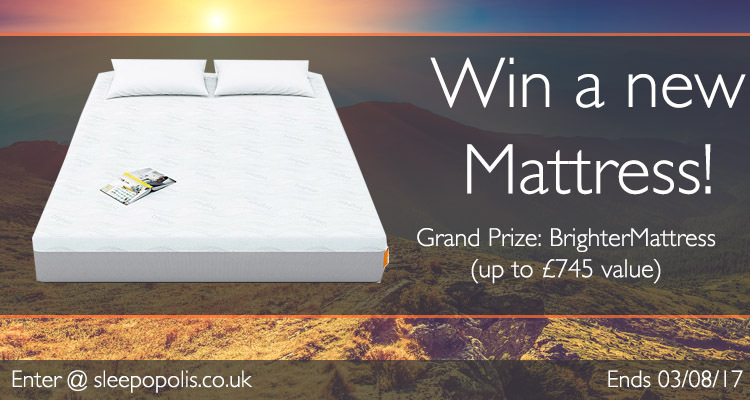 Enter our Brighter mattress giveaway for your chance to win a brand new mattress! We’re giving away one (1) brand new Brighter mattress. The Brighter is a 22cm memory foam mattress. One grand prize winner will be randomly selected and win one (1) new Brighter mattress in their preferred size (Single, Double, King, Super King). Duration: The giveaway starts today, February 22, 2017 and ends March 8, 2017 at 11:59 PM UTC (GMT +00:00). Grand Prize: One (1) grand prize winner will be randomly chosen based on the pool of entries. The winner will win one (1) Brighter mattress in their preferred size. Sponsors: The Brighter mattress company is sponsoring this giveaway by providing the mattress to Sleepopolis to give away. Brighter will mail the prize directly to the winner. Brighter may email you with follow up details about their giveaway and/or their company. If you do not wish to receive these emails you may unsubscribe from communications with Brighter via an unsubscribe link included in all of their email communications. Brighter may be new on the block, but they’re looking to make a lasting impression right out of the gates. The Brighter mattress is built from 100% foam, with a primary comfort layer of memory foam. Although this mattress does contain a memory foam top layer, it does not feel like traditional memory foam mattresses. Brighter is just a touch firmer and offers more of a floating feel. That said, there is still an enjoyable level of pressure relief, contour, and most importantly, support. For more on the Brighter mattress check out my full Brighter mattress review or visit them at BrighterMattress.co. Back in agony!!! Please help with a brand spanking new mattress!! I can only dream of getting a new mattress!! I know how a cork in a bottle feels with the springs on current mattress popping through!! My pleasure! Best of luck to you in the giveaway. I love memory foam mattresses so good for my slipped disc. Would love a new one for my bed, sounds just the job thank you. I would love to win this a new mattresse for my king size bed would be lush. What a great prize A memory mattress will let me sleep all though the night. no waking up because I’m uncomfortable. Thank you for entering, Susan. Keep those fingers crossed, Carys! Good luck to you, Clive! I’ve been longing for a new mattress! I’m sorry to hear about the troubles with your current mattress, Jackie. So love memory foam mattresses, ours is 12 years old.It is a minefield out there now, so many makes, decisions, decisions.!! I would truly love to win a new mattress,I would be so…….. Happy! I never win anything, but if I had to win, I would hope to win a mattress. I just can’t find one that feels right for me. I have tried them all. Spring, foam, latex…please help! I want to leave a good review for a mattress!! I want to sleep through the night without back pain…I want to feel excited about going to bed! !